BlogAdda in association with Red Chillies Entertainment presents #DearZindagi activity where we want you to write a letter to life conveying your love and gratitude! It’s time we turn back the pages of book of life and fall in love with it! We at BlogAdda would love to cast an eye over your letter to life. We want you to write a letter expressing your emotions to life, for all the things it bestowed you with! Participate and blog for the #DearZindagi activity to win exciting prizes. 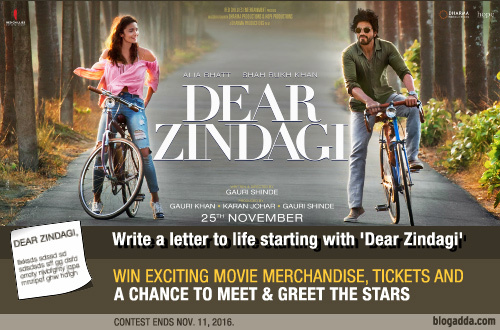 Write a letter to life starting with ‘Dear Zindagi’! 2 Winners will get to meet the stars of the movie. Top 20 entries will win couple movie tickets at PVR cinemas for the first weekend of Dear Zindagi. First 50 valid entries will win Tees/Autographed coffee mugs. The word limit for every blog post is minimum of 500 words. Embed this link of Dear Zindagi Teaser Video on the blogpost. The last date of submission of your blog post is midnight, 11th November 2016. Get going, and write a letter ornamented with love to your precious life. We are waiting to read the wonderful letters to life! This sounds great and I can’t wait to participate. This already sounds exciting to me even before the win. Would love to participate in the wonderful contest!! Is there any maximum word limit ? and is there any limit on number of posts ? Does that mean I can write one more to increase the chance of winning?! I submitted one already!! Please reply quickly!! Can you please how did you embed the video. Just copying the link and pasting over there isn’t helping. Love you Zindagi. A letter to my beloved Zindagi. First click the video on this blog adda website, it would open through YouTube. Copy the link. Go to insert video in your blog page and paste the link in the opened window. Then select/upload the video (just like we insert pictures). Otherwise your blog wouldn’t be considered valid. Wish you all the best for this contest. I am so thrilled. I have poured my heart out. Guys please do give it a read! Can I submit it before midnight UK time? Thanks! Pls confirm the submission and validity of post! DEAR ZINDAGI – Wish to live in the present without worrying and expectation. I got late by four minutes due to some technical issues while submitting. Team, please do let me know if my entry is still valid. I hope it’s still a valid entry. Apologies for the inconvenience caused. Dear Blogadda, Thanks a lot for conducting these exciting contests so often… It is indeed encouraging for writers like myself to like regularly and think beyond a particular genre…..